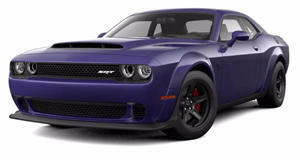 The Hellcat Redeye has done a pretty good job of bridging the gap, but what muscle-car enthusiasts have really been looking forward to is a more powerful replacement for the Dodge Challenger SRT Demon. And that's just what FCA has in store for us. In spades. At the start of the new month today, Fiat Chrysler released this teaser image and a few details for the most powerful – and expensive – version of the Challenger yet. It's called the Ghoul, and it's slated to pack an even bigger punch than the Demon that was dispatched back to the fiery bowels of hell from whence it came. Exactly how much muscle it'll boast, SRT hasn't said just yet. But the Ghoul promises even more than the Demon, whose 6.2-liter supercharged V8 produced 808 horsepower on standard pump gasoline, or 840 on 100-octane racing fuel. As tuners like Hennessey have proven, there's even more capability to be unlocked in the supercharged Hemi, and Mopar even offers a 7.0-liter version as a crate engine producing 1,000 horsepower. The Ghoul could carry either, but the prospect (however unlikely) that really tantalizes us is that SRT could revive the Viper's 8.4-liter V10, and maybe slap a supercharger on that to further increase output. One way or another, it ain't gonna come cheap. FCA has already started taking deposits at $20,000 a pop, and has indicated the down-payment will represent roughly ten percent of the final purchase price. It doesn't take a graduate degree in advanced mathematics to discern a $200,000 sticker price for the 2020 Dodge Challenger SRT Ghoul. That would make it more than twice as expensive as the $84,690 Demon (pictured), and significantly more than the $120k Corvette ZR1 – but still less than half the $450k Ford GT that, like the Challenger, is made in the Canadian province of Ontario.